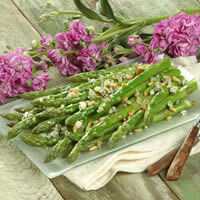 This simple yet elegant side dish blends asparagus with blue cheese to wow your pallette. To make vinaigrette, mix vinegar, shallot, 1/8 teaspoon salt, and pepper. Whisk in oil; reserve. Blanch asparagus in a frying pan large enough to hold asparagus in one layer. Bring approximately 3 inches of water to a boil. Stir in 1 tablespoon salt. Add asparagus. Cook at a medium boil until fork tender, about 3 minutes, depending on thickness. Drain on paper towel; cool. To assemble, arrange asparagus on a platter; drizzle with vinaigrette. Roll spears to coat with vinaigrette. Shred cheese onto a piece of wax paper, using the small holes of a shredder. Evenly sprinkle shredded cheese over asparagus; scatter pine nuts over cheese. Preparation Tip: Recipe can be made ahead. Refrigerate vinaigrette and cooled asparagus, tightly sealed. Return to room temperature before serving.